It's a point that comes up often in conversations about videogame storytelling: You read a novel, you watch a film but you play a game. Literature and cinema, while worlds apart from one another, are passive media. By contrast, games are much more of a performance - carefully orchestrated, but ultimately in the player's hands. In that sense, the underlying structure of an altogether separate medium - music - is far closer to that of gaming than you probably realize. At their heart, the way games guide players through their inner workings is a lot like how a musician reads a piece of sheet music. Musical notation is purely causal, as it directs the musician how the piece should be performed. Full of differing instructions like repeats and codas, you very rarely progress straight through a piece of music the way you would a novel or film. Time signatures, keys, rhythms, dynamics - sheet music contains incredibly precise directions on how to perform the piece. Not everyone can read it, either; musical notation must be parsed by a trained musician before a listener can interpret it. In the same way, a gamer also has to follow very detailed instructions in terms of timing inputs, coordinating button presses and dealing with graded elements of control input intensity. You can't hand the controller over to anyone, either - complex games require the specific skillset of an experienced gamer in order to be successfully parsed. But despite this core similarity, there's a crucial difference in audience expectations between these two media: People don't assume that a piece of music must tell a story. More often, music transcends that and allows players to fashion imagery in their own mind. Beyond the auspices of the composer that wrote the piece, the emotional and intellectual interpretation is the musician's own. It's something that is meant to be personal. That's not to say music can't communicate a story - pieces like tone poems infer a plot without relying on spoken language. In fact, many aspects of modern-day film scores owe a lot to the narrative inference used in tone poems. So why does understanding how games are written and their similarity to music mean anything? 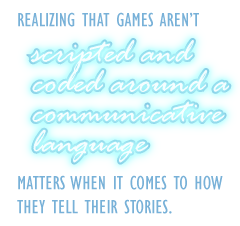 Because realizing that games aren't scripted and coded around a communicative language is an important distinction to make when it comes to how they tell their stories.